My name is Christina and I work at a small German based firm who develops ERP solutions for book, wine trade and music stores. Our customers call me if they have questions how to operate our ERP systems. I train them so they get to know the software for the last 15 years. My husband works at the same place, as a software developer, a bit more than 20 years. My passions are music and sports; I am a singer in a rock/pop band and play the rhythm electric guitar, with sports I especially love running, but also cycling, strength training and probably any kind of physical activity. How long have you been eating plant-based foods and what made you get into plant foods? My husband and I have been vegan since 2008. We moved to the countryside in 2004 and it is very common here to help each other within the neighbourhood. So we went over to one of our neighbours who is a conventional pig farmer, when he asked us to help him enlarge the piggery. In one half, there were pigs getting fattened, in the other half we were working. We heard and smelled the pigs and felt really bad. Ever since I was a student, I had been buying organic food and also organic meat and was ok with that habit at that time — but that changed after the above experience. That night, when we were back home having dinner (with organic meat), my husband said: “That’s it. I’m done with animal products. I don’t care what you do, but I won’t eat any more animal parts”. First I was shocked since I hadn’t expected such an outburst from my — mostly calm — husband. We have known each other for more than 25 years so there was no need to ask for the reasons but we discussed the matter for quite some time and I ended up looking up “vegan” in the internet, to see what we could “still” eat… I remember I was worried I couldn’t make it without curd cheese… we gave away everything which was not vegan and went completely vegan that next day. Never regretted it ever since. Christina outside VX in London. 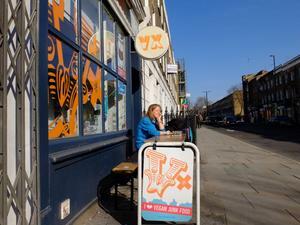 She loves the vegan options in London! I love cooking and making spreads and plant cheeses, I bake a lot different breads, I love pastry and I am very much into clean eating. Since I was raised by a mother who became vegetarian because of her health when I was about 10, I grew up with whole-food and maybe therefor still consider it soul food, I still love it. My favourites vary from time to time, I love one-pot-meals, especially in the winter but am also a great fan of classic german kitchen as my grandmother and aunts cooked. I love Spanish food, but also Indian cuisine and typical dishes from all over the world. Breakfast at the moment is mostly freshly shredded oats, buckwheat and spelt, soaked with water over night. In the morning I add a mashed banana, half an apple and half an orange or any other fruit available, some nuts on top. Love it, never get tired of it. When we work, I prepare something the day before which we take with us, often a stew with legumes and different vegetables. I love the variety of tastes you can reach with stews, hot curries, tomato-based stews even sweet notes can be applied. In the evening we e.g. have a large salad with roasted nuts and fresh sprouts on top. Often accompanied with Seitan, tofu, tempeh… we have an ice-cream-maker so quite often we do have ice-cream as dessert, basis is a soya yoghurt. I couldn’t live without curd. I don’t miss a single food since I switched, I found an even tastier plant alternative for literally everything. (minus a boiled egg, but I never missed that). I’d say nuts, vegetables and legumes. You can combine them in countless varieties, tastes and textures and they provide you with everything you need. Absolutely, I have psoriasis and that condition improved so much since I went vegan, it is incredible. I also recover much faster from trainings than I did before and I am hardly ill at all. Yes, it has. I have the impression that my thoughts and actions are more sorted, more straightforward. I have more empathy to all living beings. I am much more honest with myself and also with everyone else. I am not willing to sugarcoat truths just because they may be uncomfortable - I don’t force my views on anybody but do speak my mind if I am asked. I think I got even more critical than I was before concerning main stream beliefs and actions—anyone who made the connection friends not food will. What advice would you give to someone who is thinking about getting into plant-based foods? Don’t overthink it, just do it! Ask vegans for help if you need any information or if you are uncertain about anything, the vegan community is very helpful. The advice would be that it makes sense to get connected to other vegans for support because the only thing difficult about being vegan is (at the moment still) belonging to a minority. That can be tough sometimes. 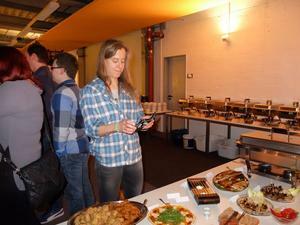 Christina at the company Christmas party in front of the vegan options that was paid for by the the company—cool!